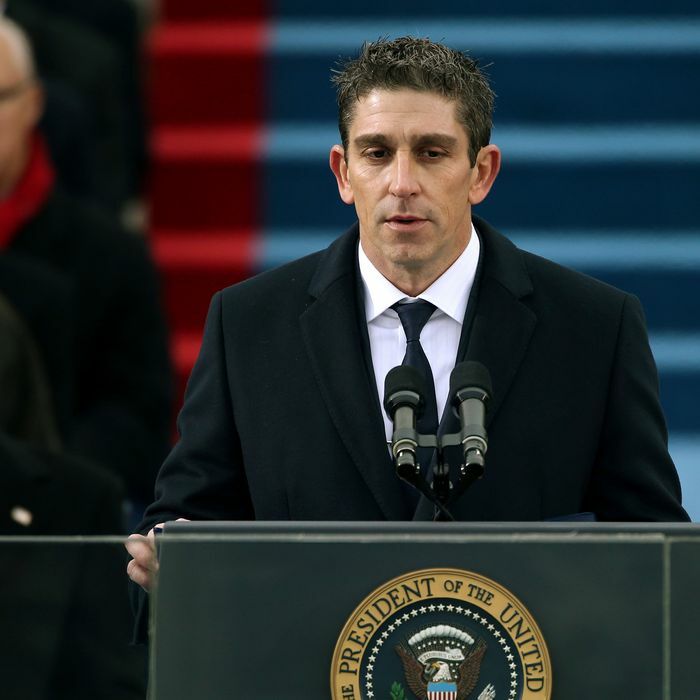 In reaching the inauguration pinnacle, Blanco, the son of Cuban parents who fled Castro, became the first openly gay man and first immigrant to do so. (His poem, “One Today,” is available here.) “I turned to my mom and I said, ‘We’re finally American,’” recalled Blanco, who was nice enough to take a few moments from his newfound fame to answer a few questions about gay rights, Eric Cantor’s stink-face, and, of course, Beyoncé. Congrats! It’s pretty rare that a poet can get recognized at all. What’s the afterglow like? It’s been amazing, but I do keep it in perspective. I am hoping that this whole honor and connection that the poem has made can lead to more connections and writing in the future. I’m enjoying it; I feel like I’m living through the poem right now. Did this opportunity come totally out of the blue? As far as I know, you don’t apply. There’s no submitting — I’m not even really sure how the process works. I just got a phone call on December 12. To be honest, I thought it was a good friend playing a very bad practical joke, but we checked out the name and all that. They gave me two to three weeks to come up with three poems. They were very generous — complete artistic freedom in terms of themes — and they really liked one of them. The topic of America and cultural negotiation is certainly nothing new for me. It’s something I’ve thought about a lot: my place and my Cuban ancestors’ place in America. What does it mean to be an American for me? What do I think that means to other people? I ended up writing three variations on the same theme and the poem is something that I always felt in my heart. Did you have any idea that your themes would work so well with Obama’s speech? I had absolutely no idea. I was very inspired by the Democratic National Convention years ago, where Obama first made a really big splash with the “one America” speech. That has always stayed in my consciousness and that’s why there were echoes of that. But I was thinking in the back of my head, People are going to start thinking there was some kind of collaboration on this! What was it like, as the first openly gay poet in that position, to hear Obama mention Stonewall? That was pretty amazing. I’m not sure I’ve ever heard any politician so straight-forward in that way, and also couch it in the idea of civil rights. It’s a big statement. It also further validated my sense of my place at the podium, so to speak. The administration had my back on this one. How did you feel about the pastor with an anti-gay past who was slated to give a prayer at the inauguration, but was later removed? What was it like actually being up there? What took me by surprise was that the energy of one of these fundamental American ideas, of unity and of working things out, everyone put all their differences aside. Congressmen yelling to each other — it was almost like a big family reunion. There was a real sense of unity. In a few days, they’ll go back to Congress and God knows. But I felt really entrenched in the history, and I finally realized why they do it and why they go through all through incredible effort. At least for these two hours, we are one country and one people. Maybe I was affected by my own poem, but I really felt those fundamental ideas you read about in history books. Everyone from Kelly Clarkson to Beyoncé, we were there for one purpose. So I have to ask: Have you heard about the Beyoncé lip-synching scandal? It was reported today that she used a prerecorded track. No! Really? Wow. I can’t wait … Wow. I didn’t know that happened. Oh my! Oh, that I don’t feel good about. Oh, gosh. Is it a rumor? I didn’t know anything. I was behind her, so I wouldn’t have been able to tell anything. Are you a Beyoncé fan, in general? Who wouldn’t be? Kelly Clarkson — who could not like them? But I did not lip-synch my poem! Would you if you could have, to get a perfect delivery? No, you know what’s interesting, I practice and practice, but my partner said be careful of practicing too much. The poem to me is finished when it’s read, when it’s shared, when it’s gifted. Of course, I practiced, but I tried to remain open. I was taken by being at that podium and taking it all in and really reading from one’s soul and one’s heart. I don’t think that could ever come through [in a recording]. I couldn’t imagine how I’d do that. There was a little bit of “I don’t get poetry” backlash. 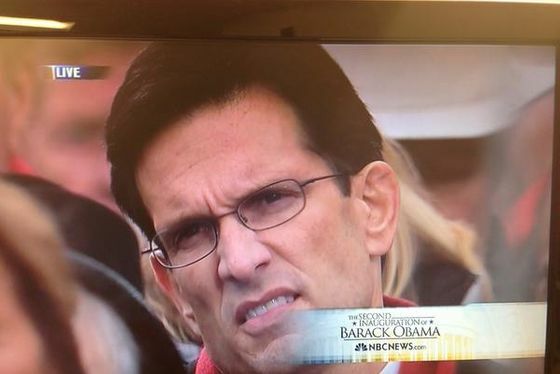 CNN cut to a shot of Eric Cantor making a confused face. What do you say to those people? I heard that! I must say, I pride myself on creating work that’s accessible. That’s not just an aesthetic decision, but it’s who I am and who I write about. My inspiration is the salt-of-the-earth community I grew up around. Honestly, I think the poem was even more straight-forward than I typically write. I don’t mind that poetry can challenge a little bit; it should, a little bit. Maybe he was just in deep contemplation and overwhelmed with emotion.